Elizabeth City, NC – OnStar will help preserve the magic of this holiday season by enabling Elizabeth City children to learn Santa’s whereabouts on Christmas Eve with a simple press of the OnStar button, thanks to its collaboration with the North American Aerospace Defense Command (NORAD) “Track Santa” program. From 7:00 a.m. on Dec. 24 until 5:00 a.m. on Dec. 25, Elizabeth City area drivers with an active OnStar subscription can press the blue OnStar button in his or her vehicle to request a “Santa Update” and find out Santa’s current location. Using sophisticated systems like the North Warning Radar System and geo-synchronous satellites with infrared sensors, NORAD monitors Santa’s location on Christmas Eve. Children may also follow Santa with the NORAD Track Santa mobile apps. Make sure to stop into Your Chevy Dealership Serving Greenville NC for great deals on the Chevy Traverse, Cruze, Impala and much more! You can also shop online and try our Build & Price Tool! Perry Auto Group has two dealership locations at 1005 W. Ehringhaus St, Elizabeth City, NC, 27909 or 1001 Halstead Blvd Elizabeth City, NC 27909. Call us at (252) 338-9100 with any questions! Elizabeth City, NC – When it comes to preparing Elizabeth City children for emergencies, high-profile situations like fires and medical emergencies around the home are top of mind for many parents. However, for emergencies in the car, young children often do not know what to do. A recent study by OnStar and Kelton Research found that less than half of parents are sure that their children would know at least one measure to take in the event of a car crash (46 percent) or a medical emergency in or around a vehicle (47 percent). Comparatively, 72 percent of parents expect their kids would know what to do if there was a fire in the home. “Parents know how important it is to teach kids about safety in the home, but think how much time kids spend in cars. A few simple precautions can make a big difference,” said Kate Carr, President and CEO of Safe Kids Worldwide. In addition to a number of educational programs that Safe Kids Coalitions offer around the country, OnStar and Safe Kids are providing parents some tips to help prepare children for an emergency that might take place in or around the vehicle. Car Seats: Safe Kids recommends keeping kids in rear-facing car seats as long as possible, as it is the safest way for children to travel. Children more than two years old can sit in forward-facing car seats or in rear-facing convertible seats as long as the child hasn’t reached the maximum car seat weight or height. Many forward-facing seats can help protect kids from 50 to 85 pounds. Booster seats protect kids up to 100 pounds. Always make sure the car seat is properly secured according to manufacturers’ instructions. Airbags: Remember that children who are up against or very close to any airbag when it inflates can be seriously injured or killed. Never put a rear-facing child restraint in the right front seat. It is also better to put a forward-facing child restraint in the rear seat as well. Check the owner’s manual to see where the airbags are located in your vehicle. Safety Belts: For children who outgrow their booster seats, proper safety belt technique is critical. Show your child how to properly put on and take off a safety belt on their own. Make sure they know that the shoulder belt should always be worn in front of their chest, centered on the shoulder, and the lap belt should be low on the hips, contacting the thighs, not the stomach. Take Safe Kids’ safety belt fit test, to be sure your child is ready to advance to the safety belt. Educate about OnStar: If your vehicle has OnStar, you should make sure your young passengers are educated about its capabilities. In the event of a moderate-to-severe crash, OnStar will automatically connect to a trained advisor who will ask if everyone’s OK and can send emergency help to the location of the vehicle. It’s important that children know they can trust this OnStar voice and that they should answer any questions the advisor may ask and follow directions given. It’s also crucial for kids to understand how to use OnStar in a non-crash-related emergency. Inform them that the red emergency button on the rearview mirror is just like dialing 9-1-1. If the driver is in trouble and cannot press the button for some reason, kids should know that this is a fast and easy way to call for help. However, you should tell them to never play with the buttons. Sit with shoulders against the back of the seat. Position the head rest to protect the head. Keep your head away from the door panel or window as that could cause injury. Keep your legs in front of you, not to the side. Stow all belongings so they do not injure passengers in a crash. Car Keys: Never leave children alone in a vehicle with the car keys. Children could operate the power windows or other vehicle controls that can be dangerous. Children can be seriously injured or killed if caught in the path of a closing window. Do not leave the keys in a vehicle with children and never leave a child alone in a vehicle. Lock all doors after leaving an empty vehicle. GM Foundation has supported Safe Kids for the past 16 years, beginning with the Safe Kids Buckle Up program. Safe Kids conducts programs for kids and families around the country and in Elizabeth City that teach safety messages, including how to use OnStar, common vehicle myths, tips and more. A Cub Scout program is geared for kids ages 7-10; the Safest Generation program is tailored for kids ages 11-12 and the Countdown2Drive programs reaches older kids and young teens. Visit www.safekids.org to find a program near you. If you would like to learn more about the Onstar, please feel free to contact us or just stop by our store and we will be happy to field any questions you might have. If you’re looking for a higher level of in-vehicle wireless connectivity and customized infotainment options, the unmatched safety and security of OnStar® (2), look no further than the 2012 Chevrolet Volt and Equinox. 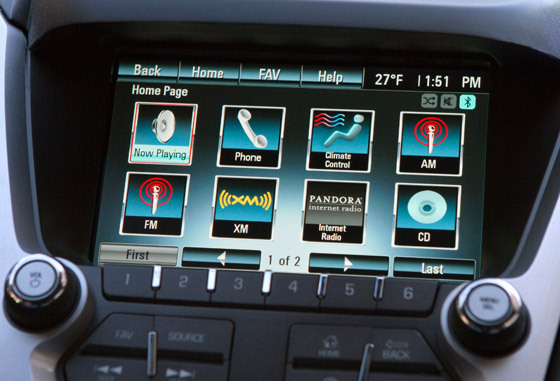 They will be the first to offer Chevrolet MyLink – an in-car infotainment package that seamlessly integrates online services like Pandora® Internet Radio and Stitcher SmartRadio® using hands-free voice and touch-screen controls via Bluetooth® (3) device connectivity for select phones. MyLink adds stereo audio streaming and wireless control of smartphones, building on the voice-activated Bluetooth (3) hands-free calling capability already offered in most Chevrolet vehicles. MyLink also includes a seven-inch diagonal, high-resolution, full-color touch-screen display that makes media selection easy to navigate. Enhanced hands-free voice control system powered by Nuance®, which allows simple voice commands to initiate phone calls and select radio stations or media from portable MP3 players and smartphones. A tap of a button on the steering wheel enables intuitive verbal control of smartphone applications like “Play (artist name)” or “Call (name of contact)” keeping your hands on the wheel and your eyes on the road. Pandora Internet Radio allows you to create personalized radio stations based on your favorite artists or genres and Stitcher SmartRadio enables access to thousands of audio programming choices, allowing you to build a personalized listening experience. Gracenote®: Identifies the music collection on your smartphone or MP3 player and presents information such as artist name, genres and album cover art on the MyLink screen and enables you to select similar music to the tunes you love. Upgraded USB (4) connectivity: While Chevrolet has offered auxiliary device connectivity since 2006, MyLink adds flash memory capability to its USB device connections. Come check out MyLink at Performance Chevrolet.